With the 2.5” solid state drive prices dropping and their capacity increasing, there are more and more computer users starting to upgrade their hard disk drive to SSD. If you are computer literate, you may have more than one 2.5” SSD installed in your system. Since every computer has limited hard drive slots, what will happen if you are running out of storage space but at the same time your system is out of physical drive slots for adding more drives? The ICY DOCK Flex-Fit Quattro MB344SP HDD / SSD bracket is your answer. The Flex-Fit Quattro takes up to 4 x 2.5” HDD / SSD and only uses 1 x external 5.25” bay. 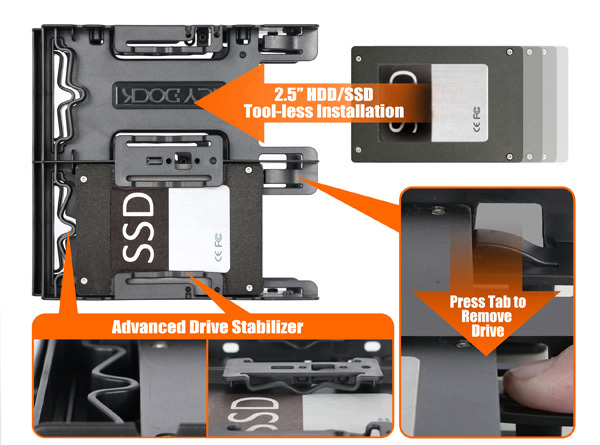 The space saving design allows you to optimize your storage density and free up your valuable hard drive slots. With a tool-less drive installation design, the Flex-Fit Quattro lets you to easily insert or remove the HDD / SSD without dismounting the entire bracket from the system. This is extremely useful when adding additional HDDs / SSDs to your system, simply open the side panel of the PC case; insert the new HDD / SSD into the bracket and then plug in the cables and you are ready to go! The Flex-Fit Quattro MB344SP is our most advanced quad 2.5” HDD / SSD bracket and we’ve designed this unit to be both user-friendly and highly flexible. The Flex-Fit Quattro MB344SP accepts up to 4 x 2.5” SATA HDD / SSD drive from 7mm to 9.5mm in drive height, which uses a completely new tool-less drive installation design with an advanced drive stabilizer system to simplify our drive installation process –all you need to do is insert the drive, and push inwards until an audible “click” is heard to indicate that the drive is securely installed. The drive stabilizer kits will automatically conform to different drive height and adjust the drives in place while providing full access to the drive. Lastly, the easy to access drive eject button allows for quick hard drive swapping in a matter of seconds without removing the entire bracket from the chassis. The best part about this bracket is it’s completely tool-less drive installation –just insert the drive and you’re set. It does not get any easier. 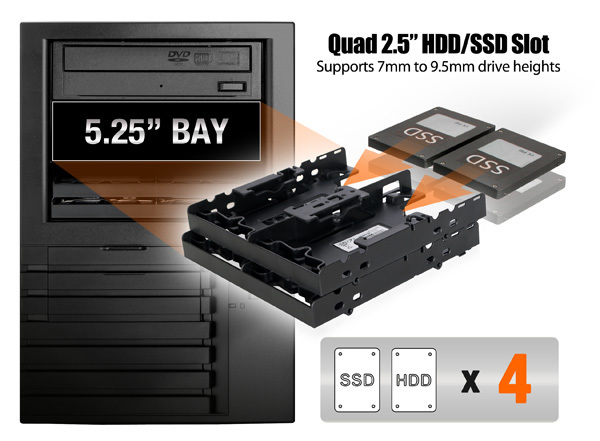 With MB344SP’s high drive density design, you can put up to 4 x 2.5” HDD / SSD altogether in a single 5.25” bay for better cable management and system cooling performance. To install the Flex-Fit Quattro, simply remove the 5.25” drive bay cover, insert the Flex-Fit Quattro into the 5.25” bay and secure it with four screws. Finally, install the 5.25” bay cover back to the computer case and it is ready to use! 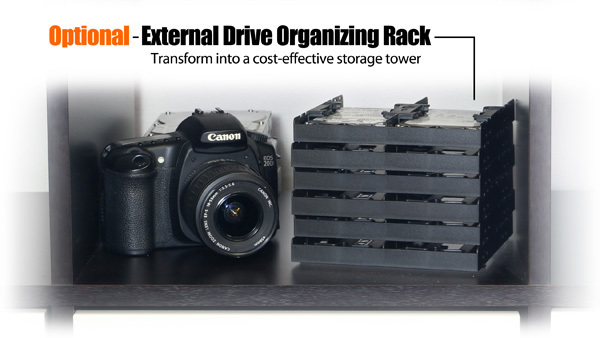 On top of that, the Flex-Fit Quattro MB344SP can be used as an external drive organizing rack, with the option to stack multiple brackets on top of each other to create a cost-effective storage tower. This is extremely handy for people who have large collections of 2.5” drives such as media professionals. Our Flex-Fit Quattro MB344SP is constructed with highly robust ABS plastic and fuses desirable traits such as durability and light weight. Using a sturdy plastic open frame design provides excellent durability and passive cooling factor which as a result, reduces the chances of mechanical failures while using the bracket. 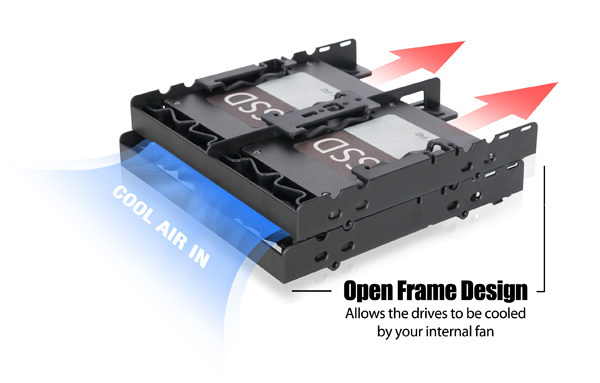 The open air frame design allows the drives to be cooled by the internal fans in your chassis. Along with our skeletal design, the Flex-Fit Quattro allows airflow in all the crucial areas of the drive which helps the drive's performance.